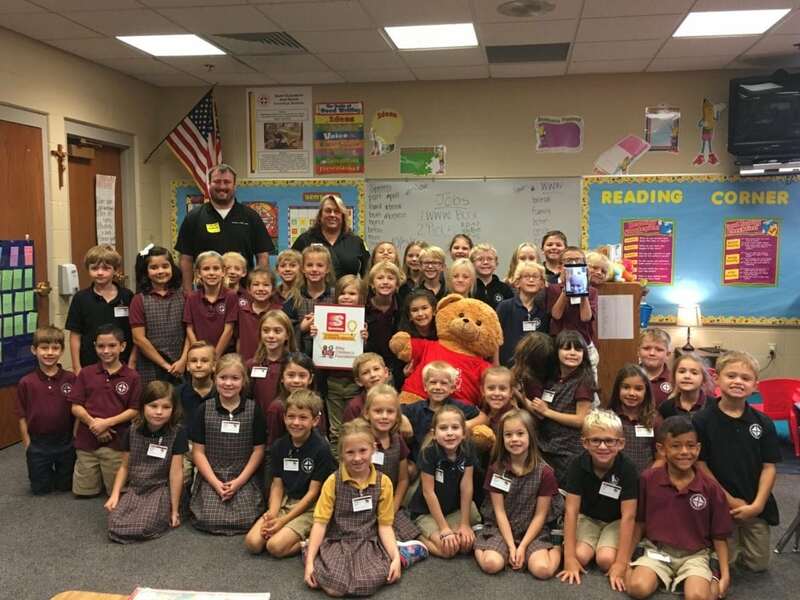 The 2nd graders at St. Elizabeth Ann Seton Catholic School in Fort Wayne, IN received a Bear in the Chair from Speedway LLC and Riley Hospital for Children. Speedway District Manager Michael Melwid and General Manager Kelly Simpson attended the delivery. The bear is for patient and Riley Kid Anthony, who joined the class and delivery via video conference. The Bear in the Chair program is a “Remember Me” type program that provides giant teddy bears to classrooms when a student is hospitalized for more than two weeks. The Bear will sit in the student’s chair while they are recovering and travel the school with classmates and participate in activities on the patient’s behalf. This program is funded 100% by the employees of Speedway LLC in Indiana. Speedway is celebrating their 25th anniversary as a Children’s Miracle Network Hospitals corporate partner. We thank the thousands of Speedway associates and their loyal Speedway customers for raising over $1.9 million in 2015 for Riley Hospital for Children and supporting so many other Children’s Miracle Network Hospitals around the country.